Rapid adoption of company’s AI-powered auto dealer marketing solutions has driven five-year revenue growth of more than 67,000 percent. CHICAGO–LotLinx, the industry’s No. 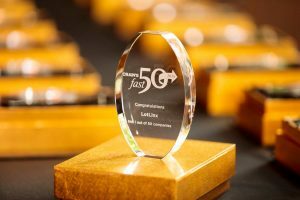 1 Automotive /AI/™, has been ranked the fastest growing company in Chicago on Crain’s Chicago Business annual Fast 50 list. Since 2007, Crain’s has annually recognized 50 Chicago-area businesses with the highest five-year revenue growth rates. LotLinx has grown 67,879 percent during the past five years, as their customer and partner network evolved to include thousands of dealers and agencies throughout the U.S. In fact, a recent independent third-party marketing study noted that LotLinx performed 19 times better than the average digital media solution for auto dealers, and in-market shoppers were 3.3 times more likely to purchase vehicles from dealers using the LotLinx platform. “Len Short treats his artificial-intelligence-powered advertising platform a little like a clever pet. He feeds it data and then watches with fascination as it grows smarter. ‘You see this heartbeat, heartbeat, and then all of a sudden—boom!—it just starts climbing like an F-16,’ he says. The company will continue its forward trajectory with new product releases to be announced this fall. Dealers can learn more about how LotLinx /AI/ is changing the automotive industry at the Automotive Intelligence Summit July 24 to 26 in Raleigh, North Carolina. LotLinx will also be participating in other industry events later this year including Digital Dealer 25 Oct. 16 to 18 and the 14th Annual Kain Clients & Friends Digital Success Workshop Nov. 13 to 15. LotLinx, the industry’s #1 Automotive /AI/™, is a technology company dedicated to empowering automotive dealers and the agencies that work with them, up to the OEM level. LotLinx-VIN Specific™ digital marketing campaigns use artificial intelligence to manage inventory-specific consumer demand based on a dealer’s monthly sales goals, dramatically increasing vehicle sales velocity and VDP conversions while reducing digital advertising and inventory carrying costs. Founded in 2012 and based in Chicago, LotLinx works with thousands of dealers including rooftops under the nation’s Top 100 auto groups, and recently expanded into the Canadian market.